Scanning YouTube for popular science videos, I found a jewel — clocking over 10 million views — titled "Five Experiments That Could Have Destroyed The World." The fact that we are here means these experiments did not succeed on this front. The message, however, is quite clear: We toy dangerously with things we barely understand — and the consequences could be cataclysmic. It's the fear that humans are not prepared for certain kinds of knowledge as they explore forces beyond their control. 1. Kola Superdeep Borehole. Russian scientists started boring a hole in the Arctic Circle in 1970, reaching a depth of 40,230 feet (12,262 meters) by 1989. Despite the efforts, the hole reached only about one third of the way through the Baltic continental crust. It's certainly not planet-threatening but still very useful for geophysical studies, including the analysis of rocks from the Archaean age, older than 2.5 billion years. Although no demons from hell were freed (some feared they would be), a surprising discovery was the large amount of hydrogen that made the deep mud appear to be boiling. It was a typical Cold War project, as the U.S. held the record until this point with the Bertha Rogers hole in Washita County, Okla., at 31,440 feet (9,583 meters). 3. Large Hadron Collider. The behemoth particle accelerator from the European Laboratory for Nuclear Research (CERN) located near Geneva, Switzerland, was designed to collide beams of protons moving nearly at the speed of light. On July 4, 2012, scientists reported the discovery of the Higgs boson after a four-decade-long search, a triumph of modern technology and advanced particle physics. The collisions can produce mini black holes, a possibility that prompted many to fear that such objects would grow uncontrollably, swallowing the planet whole. Again, detailed calculations showed this to be nearly impossible: The mini black holes would evaporate in fractions of a second. Furthermore, collisions of even higher energies occur frequently when cosmic rays — particles traveling through space — hit the molecules of nitrogen and oxygen in the upper atmosphere. 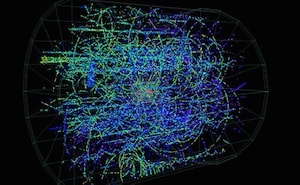 If we have survived for more than 4 billion years, we should be safe from the LHC experiments. 4. Starfish Prime. In 1962, the U.S. detonated a large nuclear bomb at an altitude of 250 miles, seeking to disrupt Soviet missile systems. The Cold War, again, was the culprit here. The detonation could be seen 900 miles away — and a radiation belt was created around Earth that lasted for 5 years, affecting low orbit satellites. But no planetary cataclysm should have been feared, apart from an exchange of fusion bombs with the Soviets. 5. SETI. The Search for Extraterrestrial Intelligence is a program that has been looking for radio signals from alien civilizations for more than five decades. The fear here is that we are also sending signals that could betray our position in the galaxy, making us easy prey for the nasty aliens. Again, the odds are extremely low for many reasons; one being the vast interstellar distances that even with incredibly advanced technology would take hundreds or thousands of years to cover. (With our technologies, it would take some 100,000 years to get to our nearest stellar neighbors.) If advanced civilizations do exist in the galaxy — and that's far from certain — they would have had plenty of time to colonize their neighboring stellar systems. The absence of evidence of alien visitation should be a comfort to us. Not proof of total absence — for this kind of proof is impossible scientifically — but certainly of the rarity of advanced life forms in our galactic neighborhood. The biggest fear, it seems to me, comes from mutually assured destruction due to global thermonuclear conflict, a threat that, even if more remote now, is always very present. Still, that's a cataclysm created not by scientists performing experiments, but by politicians that have the power to push the button.